Former Radio 1 presenter Mike Smith has died at the age of 59. 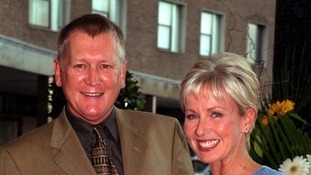 Smith, who was married to fellow television personality Sarah Greene, died in hospital on Friday from complications connected to his recent major heart surgery. 'Heartbroken' friends and colleagues of former Radio 1 DJ Mike Smith, who has died aged 59 following complications after heart surgery, have paid tribute to the man they called "the consummate broadcaster." Friends and former colleagues of BBC Radio 1 presenter Mike Smith have described their "heartbreak" after the 59-year-old died in hospital. Breakfast Show alumni including Noel Edmonds, Mike Read and Simon Mayo joined others from the world of entertainment in mourning Smith's death. Edmonds, a long-term friend of the couple, said in a statement: "I am totally stunned and heartbroken for Sarah and his family. Mike introduced me to motor racing and I introduced him to radio. He was so much more than simply a presenter. Mike was that rare individual - the consummate broadcaster in an era when professionalism, dedication and hard work were truly valued. I am typing this through the tears. I wish I had told him more forcefully and frequently how much I admired his talent and valued his support. Former Radio 1 presenter Mike Smith has died at the age of 59. Watch these videos to see how Smith and his fellow Radio 1 presenters celebrated the station's 20th birthday in 1987. Radio DJ Simon Mayo has recalled when Mike Smith first joined Radio 1 describing him as the 'guy who had it all'. Shocked to hear of Mike Smith's death today. Condolences to Sarah and all his family. Former controller of BBC Radio 1 Johnny Beerling described Mike Smith "as a very versatile broadcaster and a very original one" as he could easily switch between radio and TV. He added: "He was a wonderful broadcaster, a good lad, and we will miss him." He recalled that Smith was good with a live audience, noting that "he was a very good racing driver as well, so he had good reactions" and could also pull off a good stunt. Mr Beerling told BBC News: "On April 1 1986 he announced that he would have Prince playing live on his show. Everybody got very excited about all of this - but it turned out not to be Prince the rock star, but Prince Edward, who was friendly with Mike." Fellow Breakfast Show alumnus Mike Read was among those to pay tribute to "affable, business-like" Smith today. The DJ and television personality said: "The news is just devastating. Sarah and Mike were a wonderful couple - it is truly horrible to hear. "I knew Mike as there were only five of us to have presented the Breakfast Show at that time. "He became a mainstay of Radio 1, was highly successful on television too, and started up his own business which he was very good at. "I worked with Sarah for a number of years, including around the time of the crash, so I was very fond of them both. "The helicopter crash was really bad but they just got on with it and married. "Mike was a very affable guy, fantastically business-like. It's a real loss and has come as quite a shock." Phillip Schofield has paid tribute to Mike Smith who has died aged 59 who he described as his "wonderful, bright, funny, thoughtful friend". Smith's career began at hospital radio before joining BBC Radio 1 in 1975. In 1983, Smith took over the weekday lunchtime show and took on the Breakfast Show in 1986, succeeding Mike Read. Mike founded Flying TV ten years ago and the company says his legacy will be FTV continuing to go from strength to strength." Smith was a key figure in the early years of Comic Relief but largely stayed away from the limelight after a helicopter crash which injured both himself and Ms Greene in 1988. The qualified pilot and his then-girlfriend Ms Greene were injured when the helicopter he was piloting crashed in Gloucestershire. Both passengers survived, although Ms Greene broke both legs and an arm, and Smith suffered a broken back and ankle. The Air Accidents Investigation Branch concluded that "... examination of the helicopter (including flight control, fuel, engine control, dynamic systems and the engine itself) revealed no failure or unserviceability that could have resulted in a loss of rotor speed". The couple, who married in 1989 and were childless, lived in London. In a statement released through Smith's aerial filming company Flying TV, Ms Greene said she would "like to offer enormous thanks to the staff at the hospital for their care and compassion". The statement said that Ms Greene has asked that she, her family and friends be allowed to mourn in peace.